We also got a box of strawberries! yea! I know I said I was going to use what was in the box, but, sometimes, that just isn’t do-able. Or, shall I say, I’m just not going to do it. I’ll keep trying. I am glad that they are making sure that people always put one thing into the trade box when they take one thing out. I just hope it isn’t only me that they are watching. I have decided not to be annoyed when they interrogate me 2 minutes after I trade something. 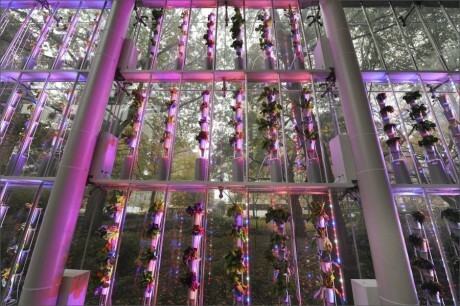 WINDOW FARMS: who knew a garden could happen in a city apartment? I’m hooked! Anyway, the cute librarian guy (yes, cute librarian guy) showed us how to, if we are handy, build a hydroponics window garden for (probably) under $50, with re-purposed/upcycled water bottles, plastic tubing (good, now I know where to get plastic tubing for making bracelets! ), and a few pet store aquarium supplies. Free instructions here. 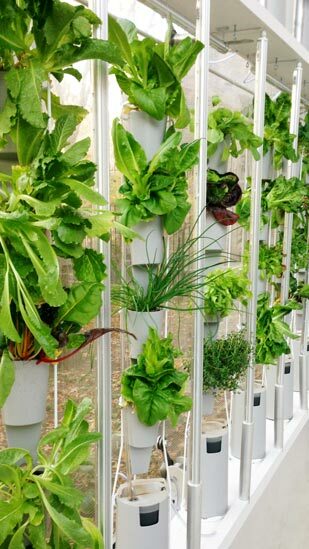 So, if I only would put out the minimal cash and foraging for supplies effort, I could have a vertical hydroponics garden in my kitchen window in a few hours or so (actually, the cute librarian guy put it together in under 2 hours, but I suspect he has been practicing). Imagine, city-dwellers! You could have a whole window worth of organic vegetables at any time of the year! For cheap! Want to see serious Windowfarms in action? The LED grow light powered hydroponic research garden is on view for 10 months at the Columbus and 79th street entrance November 2012- August 2013. Just about everything I get is going to get fermented. I’ll keep the broccoli out and eat it, or, perhaps, I might trade it, if I get there early enough and something interesting is available in the trade box. The leeks are going to be fermented –I’ve never really used leeks well, and, so have mostly traded them, but, this time, I’m going to keep them and ferment them. I may or may not keep the lettuce. I could use with a salad, but… still… I’m not always interested in salads. We’ll see what is the trade box. Just as the CSA changes things, I may change my mind about any and all of the above. If I get the zucchini, I might keep it and make spaghetti with the tomatoes, or I might not. Likewise, if there are tomatoes in the trade box, I might trade the broccoli. This time, I am going to keep the green beans, because I have a couple of fermenting recipes for green beans, which both sound good. (I’ll have to make a decision before Thursday, so I’ll know exactly what I need to do when I get home. The squash, I don’t know… i might just exchange it for more green beans if I get there early enough and the green beans are left. Otherwise, it all looks super yummy and delish, so I’ll just have to grab my share and run home.